He went on to say that, while he never gave much thought to his diet in the past, he’s been paying more attention lately to what he eats and how it makes him feel. He cut out dairy, at first because it made life with his girlfriend, who is lactose intolerant, easier. Now he’s sticking to it because his own digestion is so much better. He’s trying to rely less on sweets for quick energy, to squeeze in more vegetables, and to cook more often. And it’s making a huge difference. My friend told me that he’d never realized how much better he could be feeling until he made these shifts. I was struck by the comment because it’s one I can relate to. For years I assumed that my IBS had to be as bad as it was. I thought it was normal to crave a nap every afternoon at work, to feel more tired than awake in the morning. Becoming vegan didn’t fix everything: IBS is still a part of my life, depending on my stress, and I have other everyday challenges, like allergies and a tendency to get run down. But the dietary changes I’ve made–first going vegan, then taking the time to explore what works for me within plant-based eating–have made a huge difference in my overall well-being. 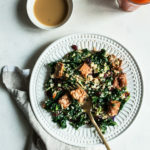 Diet may not be a cure-all, but I think it’s a vital part of the self-care toolkit—one that might also include sleep, hydration, stress reduction, and movement. As a new year gets underway, many of us are giving some thought to the resources we need in order to feel our best. For most of us, nutrition is one of them. No matter how knowledgeable we are about food, though, it can be difficult to maintain a healthful diet. As I mentioned in last week’s post, life is challenging, and many factors can get in the way of cooking and seeking out wholesome ingredients. This is why I appreciate Veestro and other brands that help to bring healthful, plant-based food within reach. Meal delivery can be a powerful tool for folks who are facing demanding life circumstances, travel, or a shortage of cooking time. It’s also a perfect option for those who are hoping to eat better but don’t have a sense of where to begin. Veestro ships vegan, non-GMO, organic, and preservative-free meals to busy customers all over the country. It offers both a la carte and customized packages, including a gluten-free bundle, a starter pack, a high-protein pack, or a bundle that’s geared toward supporting people with weight loss goals. The meals are designed to be tasty, satisfying, and pleasurable as well as wholesome. Right now, Veestro is hosting a 21-day “Yes I Can” program, which is geared toward helping people nourish mind, body, and spirit. The program includes either one or two daily meals, which are ready-to-eat, along with encouraging emails, wellness checklists, optional fitness challenges, and the resources and guidance of a vegan nutritionist. It’s not all about food, but nutrition plays a starring role, and the email updates include information on how plant-based diet can support weight loss goals, help keep us satisfied (thanks, fiber! ), and maximize nutrient density. I’ve been participating happily in the program, and I shared some early thoughts on it last Friday. Steven and I have continued to love our experience with the Veestro meals this week. We’re both savoring the food, and I’m enjoying having a little extra time that I can devote to work and school. More importantly, I love having varied meal options to choose from. When things get busy, I tend to rely on repetitive batch cooking. It does the trick, but I know how important diversity is within a healthy diet, and I’ve really benefitted from being prodded to try new things. This includes a new favorite breakfast! 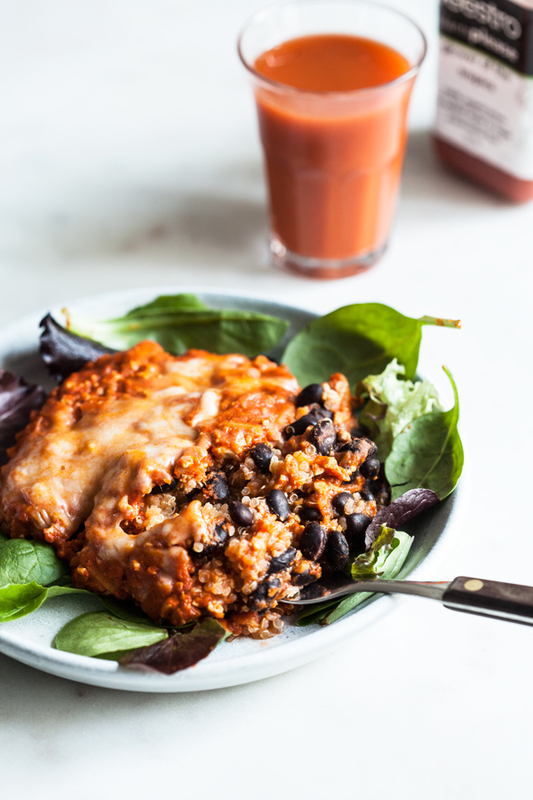 The Veestro 3-layer scramble features black beans, tofu, and quinoa, all layered together with tomato and a bit of vegan cheese to create a scrumptious morning meal. 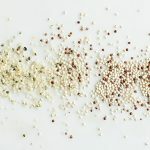 It’s basically a vegan protein bomb, thanks to the combination of legumes and quinoa, and I’ve enjoyed it both for breakfast and also as a simple supper. Veestro meals run the gamut of classic comfort food to globally inspired fare. 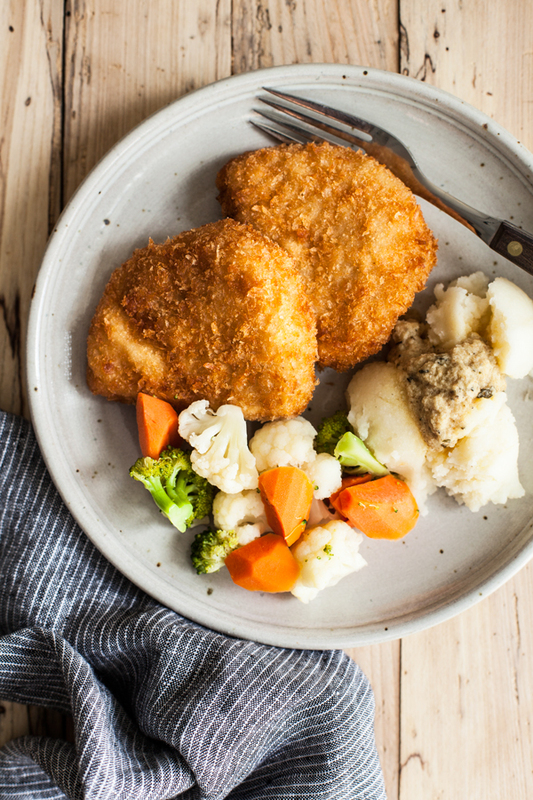 This week, we enjoyed the country fried chicken, which was cozy and homestyle, topped with a savory vegan gravy. 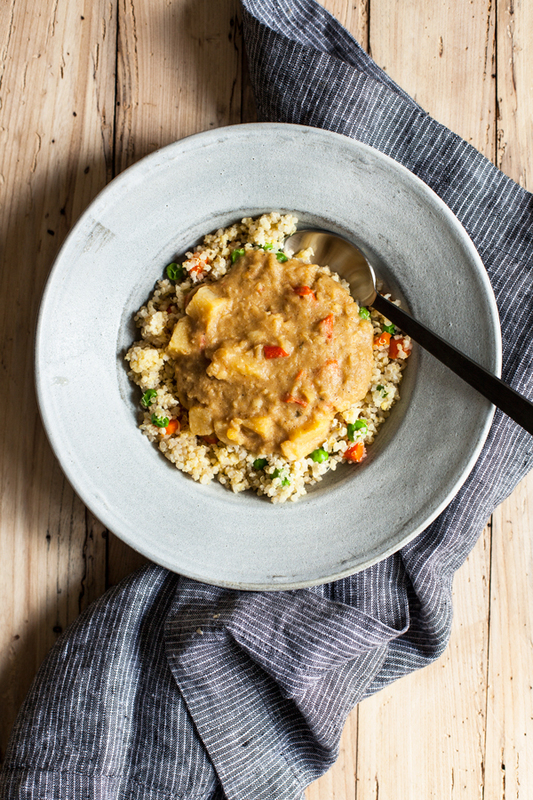 We also tasted the Moroccan melange, which is a bed of quinoa, millet, and vegetables topped with a gently spiced stew of red lentils, onions, and potato. It’s easy to taste the ginger in this dish, and it was right up my alley. Another global highlight is the red curry with tofu and veggies. 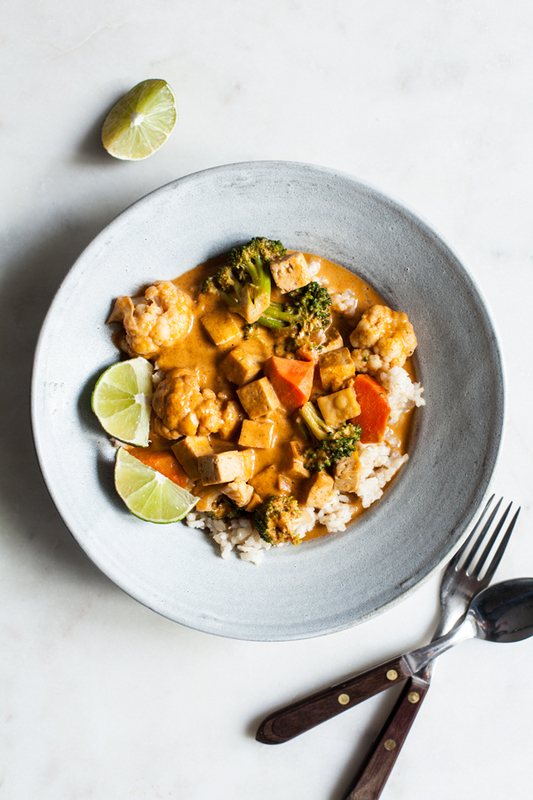 It’s made with red curry paste, garlic, broccoli, tofu, and cauliflower, and it’s served over a bed of brown rice. So fragrant and good. One of my favorite lunches this week was the chicken quesadilla, which is packed with vegan chicken, melty vegan cheese, and veggies. 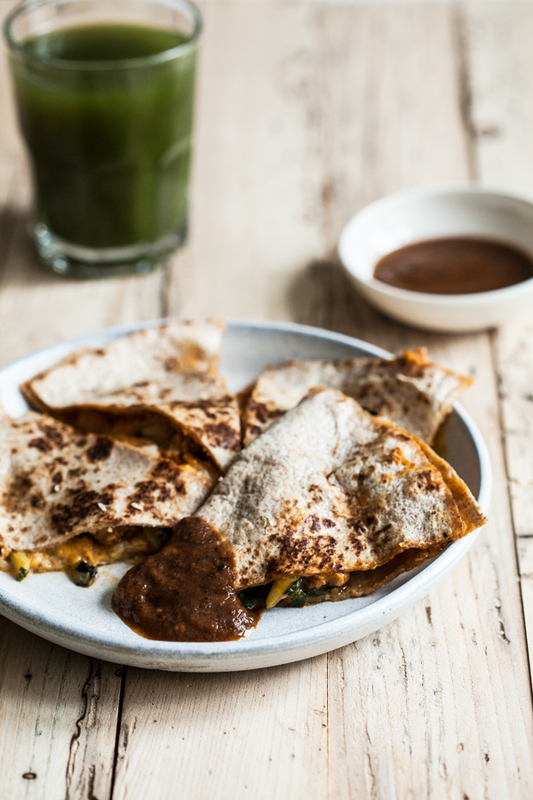 It comes with a hearty black bean dipping sauce, which was so good that I saved some extra to use as a snack dip later that day. Steven had the same dish a few evenings later, and he thought it was as tasty and authentic as I did, not to mention filling. Some of the Veestro meals are heartier than others, so it’s important to modify them in a way that works for you: we’ve made veggie sides or extra grains to serve with some of them. But for the most part we’ve been pleasantly surprised at how satisfying they are. A few nights ago I tasted the mushroom risotto, and it quickly took first place as my favorite Veestro dish. 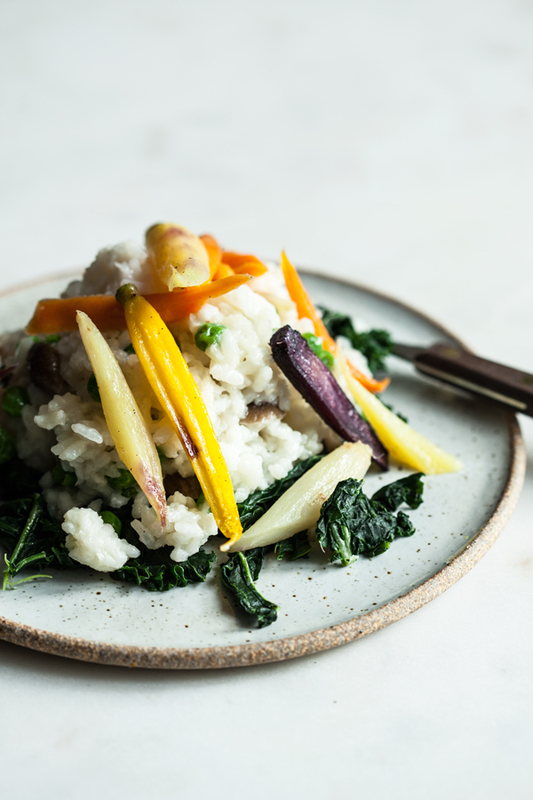 It’s a creamy arborio rice and mushroom mixture that’s served with kale and baby carrots. It has the traditional risotto flavor of shallots and white wine, along with some garlic (I added a little vegan parm, too). I was surprised that risotto could hold up to freezing and reheating, but it really did, and it’s a highpoint of my “Yes I Can” experience so far. Last week, my friend Jessie said something insightful about the process of cooking. “Each meal is only hard to make once,” she said, and “it’s all about the muscle memory.” It’s so true: cooking, like a lot of other things in life, is difficult until it’s not. Time, patience, and the willingness to keep trying are what make it into a habit. Ready-to eat meals can help to drive that process forward, giving people a taste of what’s possible with plant-based food. Many folks who are trying to become vegan or reduce meat intake don’t know what to cook. They’re confused about how to replace animal protein in their diets, or maybe they’re nervous about trying new things. Being exposed to a diverse range of vegan meals and ingredients can help to set the learning process in motion. 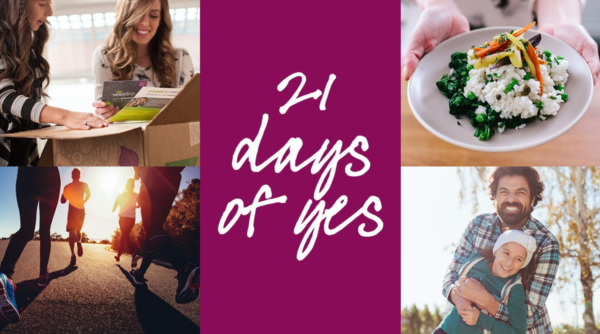 If you’re hoping to build that muscle memory–or to get back in touch with it after a period of struggle with food–the “Yes I Can” challenge is a nourishing and welcoming place to start. Today, I’m hosting a giveaway to offer one reader free access to the challenge, along with 21 complimentary, ready-to-eat vegan meals from Veestro! The giveaway is open to all readers in the US (including Hawaii and Alaska), and I’ll be announcing the winner next Saturday, when I wrap up my own experience of the program and share my closing thoughts. You can enter below for a chance to win. Good luck! I’m so excited for more people to share in this challenge. And I’ll be back on Sunday for the usual roundup of reads and recipes. love this! i’d like to have more variety in my meals (i stick to a lot of salads and stir frys). Practice yoga six days per week. It takes consistency to be strong and flexible! The nourishing habit I am practicing this month is smiling at people on the street. Seems simple, but as someone who feels a little down on long cold winter days, receiving a smile from a strange can bring a little warmth on a cold day. So this month, I’d like to be the one sending the smiles. When I’m feeling happy, it leads me to want to make more healthful choices. Curious to see their gluten free options and whether the protein is adequate. I would like to have these on hand because when work is overwhelming, lunches become less healthy. Need to start meal prepping more this year! One nourishing habit I’m implementing this month is eliminating sugar. Over the holidays it was too easy to indulge in the sweets and goodies. I would to try making homemade bread! I’ve been intimidated by it in the past but, with snow days in my future, there’s no better time to try it out. These meals look delicious! I’d love to try them. I love this Gena, so true and so helpful! Those little wins, the feeling of discovering a new connection between your actions and your health – all so powerful! So happy for your friend. I look forward to reducing my intake of refined sweets after developing the habit of eating them every day over the past month. I can satisfy cravings with flavorful, savory foods too! I’d love to cook more variety. I’m always busy as a medical student, so this would be amazing! I’ve been eating Egan all month and plan to continue doing it maybe 85% of my meals. I’m currently working on my masters in food studies and for someone who thinks about food all day long, sometimes it is unfortunately near the bottom of my priority list. I love cooking but don’t always have the time between school and work. Jumping into 2017, I hope to improve my meal planning so as to avoid staring at an empty fridge and having oatmeal for dinner. I want to start weekly meal planning! I’m trying to meditate more regularly. I’ve often thought it would be so helpful to have the option of healthful meals delivered for work nights when I’m running low on time. Thanks for the giveaway opportunity! My nourishing goal this month is more broad – just nourishing myself. I take so much time to worry about others and take care of them, and I forget to make sure I am fed, rested, and nourished well. I’m going to take time to do yoga, cook good meals, and enjoy things that I like to do (like exploring a museum)! Less negative, wayyy more positive, self-talk! I’m stopping alcohol and sugar for a month, after all the holiday indulge, time to cut back! The one nourishing thing I’d like to do for myself is dust off my juicer and go back to incorporating a few fresh juices into my week. 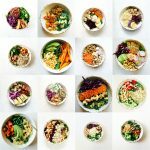 The nourishing habit I’d like to start implementing is to teach my daughter about food. I know she’s young (8 months), but we talk to her about food at the grocery store. We want to foster a healthy relationship with good foods! Oh wow, this stuff does look delicious! I too rely on old favorites so much of the time, and feel a little embarrassed about it, as I am supposed to be a creative cook. But sometimes life is just too busy. This would be a great way to kick start some new creative juices. I would like implement the habit of reading for pleasure. I am back in school now after a several year hiatus and I noticed my tendency last semester to only read school material. I miss reading books I have chosen myself, especially fiction. I want to focus on being positive both in attitude and in my health. Less negative self-talk! Thank you so much for the chance to win! Sounds like a fantastic service! What a great giveaway! This could be the helping hand I need. and my goal is No Sugar! Meditating/deep breathing more, for sure! 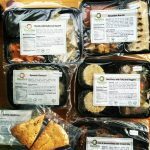 Thanks for sharing your experience about Vaastro’s, I love the idea of vegan meals being delivered all over the USA. I’m trying to cut back on sugar and to practice more Qi Gong, as it helps with my anxiety. I am implementing the habit of starting each morning with a mug of warm lemon water! My goal this year is pack on calories but still eat enough veggies. I just gave birth and am breastfeeding and getting enough nutrition is so important. This month I want to focus on helping others and giving back. I do not have a lot of money but I can help other people in non monetary ways. I’m trying to eat more veggies and fewer carbs! I will become more organized about meal prep. In an attempt to be more mindful when eating, I am trying to eat my meals away from any screens. Whether it’s my work computer, my phone or the tv. I believe this will make my healthy meals even more nourishing! Thanks for a stellar giveaway! Great giveaway! With an infant and full time work the thing I need more of is time! Particularly for sleep and also exercise. And healthy delicious prepared vegan food would help with that! I want to be more intentional about closing the screen for meal times. I’m trying to work on getting outside during my lunch break and taking a short walk! It’s been so cold lately that I haven’t wanted to leave my desk, but I always feel better when I do. I’d love to commit to yoga everyday and stop with making the excuse “I’ll do it later” because later never never comes. I would like to have a greater variety in what I eat. I’d like to cut back on added sugars! im looking to VARY my veggies. somehow I am tired of broccoli and kale, and I almost feel at a loss! More smoothies for breakfast and less bread items. I need to drink more water. I don’t think I realize how dehydrated I get each day and I think it makes me feel more hungry than I am. Easy and healthy options always needed! I need to get back to eating breakfast. I’ve been bad about skipping it lately. Wow, this is amazing. I would definitely want to incorporate more cooking. I work in a busy ER and I haven’t gotten where I don’t cook as much. I want to start cooking more and incorporating more leafy greens in my diet as well. Fingers crossed! Cooking dinner at home at least twice a week. Easier said than done when I work nights, but I’m trying to prep stuff in my crockpot. This month I’m trying to focus on how I feel instead of fixating on a number, and working hard to strive for balance over self-deprivation. Always a battle, but certainly one worth fighting. I would really like to devote more (actually, any!) time to yoga practice. I work out five days a week, but it’s all cardio, cardio, cardio – but my body is happier when I’m doing yoga at least once a week! I would like to stop eating after dinner, that’s the new habit I want. I am trying to walk everyday. More yoga, it always makes me feel so much calmer and peaceful yet it’s the first thing I bump off my schedule when things get busy, so I need to just make time for it. Eliminating more sugar and sodium from my diet. I’m trying to breathe deeply to deal with stress.